Since 1995 TEMC® designs and manufactures in Italy the DE-OX® digital measurement instruments. 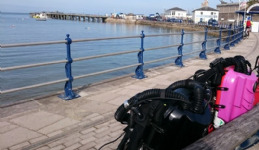 TEMC® is involved in diving, industrial, medical and military field. TEMC® is the Italian leader for production, planning and diving with mix gas like NITROX, TRIMIX and HELIOX. DE-OX® istruments are mainly designed for hyperbaric environment, human breathing systems, such as hyperbaric chambers, rebreathers, submarines and wherever it is mandatory to check the atmosphere monitoring for personal safety. TEMC® produces also static membrane for gas mixing and is specialized in the analysis of oxygen, helium, carbon dioxide, carbon monoxide, hydrogen, and many other gases. TEMC® is also able to provide consulting in his field, helping customers in finding the right solution for their safety needs. TEMC® was founded in Milan by two expert divers, with valuable skills in measurement and electronics. TEMC®’s mission is to design and develope the most up to date measuremet instruments with the latest technology available. TEMC® is the ideal partner for all professionals whose need is to have the best instruments and assistance for safety monitoring in mixed gas diving, both sport and commercial or professional. DE-OX® meaurement instruments are the necessary technical device for professionals, recreational divers, military corps, industries in order to get the best safety. All the DE-OX® products are CE marked following the applicable European norms.